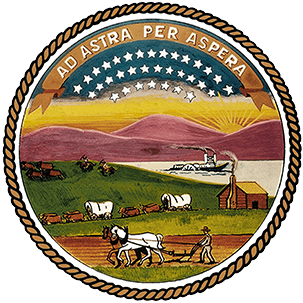 The members of the Judicial Council of Kansas are appointed by the Chief Justice of the Supreme Court, pursuant to K.S.A. 20-2201, for a term of four years, with the exception of the Chairs of the House and Senate Judiciary Committees who serve on the Council as long as they chair the respective Judiciary Committees. Reappointed for a 4-year term ending June 30, 2019. Reappointed for a term ending June 30, 2021. Appointed to complete the term of Judge Maritza Segarra, whose term will end June 30, 2021. Appointed to complete the term of Judge Robert J. Fleming, whose term will end June 30, 2019. Chair of the Senate Judiciary Committee; Began January 2017, and will remain on the Council as long as he is Chair of the Senate Judiciary Committee. Chair of House Judiciary Committee; Began January 2019, and will remain on the Council as long as he is Chair of the House Judiciary Committee. Appointed to complete the term of Nick Badgerow, whose term will end June 30, 2021. Reappointed for a 4-year term ending June 30, 2021.